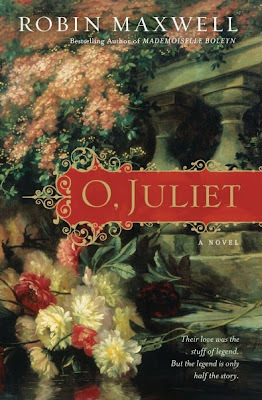 Book Review: O, Juliet by Robin Maxwell & Historical Fiction Bloggers Round Table! "Before Juliet Capelletti lie two futures: a traditionally loveless marriage to her father's business partner, or the fulfillment of her poetic dreams, inspired by the great Dante. Unlike her beloved friend Lucrezia, who looks forward to her arranged marriage into the Medici dynasty, Juliet has a wild, romantic imagination that takes flight in the privacy of her bedchamber and on her garden balcony. Her life and destiny are forever changed when Juliet meets Romeo Monticecco, a soulful young man seeking peace between their warring families. A dreamer himself, Romeo is unstoppable, once he determines to capture the heart of the remarkable woman foretold in his stars." Oh.. my heart, my heart!! Sweet torment of love! This was a riveting story that had me on the edge of my seat, and still, it was a love story that we all think we know. I have learned that there are mixed feelings about this novel.. this is to be expected when this is a retelling of an age-old story, told many ways before... I agree that this story idea is not a new one, and perhaps Maxwell's writing is not what others would think of as five star material, but I am going with my gut instinct on this read, and awarding it the coveted five stars because of the way I felt when I was through reading it. I was not as disappointed as other reviewers were; I had no high expectations for this one; I couldn't put it down; I loved every word of it; I was emotionally drained after going through all of the tragic events; and I was still surprised and heartsick at the ending, which stayed with me in my heart for days after reading this novel. I am not a voracious romance reader, and this filled that void. So .. flog me. Robin Maxwell has written successful novels focusing on Tudor England previously and has repeated her recent Signora Da Vinci setting and brought her readers into Italy; this time we are in Florence, even though traditional Romeo and Juliet fans would disagree on this location (LUCY!). Robin Maxwell rewrites Shakespeare's beloved Romeo and Juliet tale with her fabulously eloquent prose, allowing the average non-Shakespearean-expert to sit back and relish this story as Shakespeare meant it to be enjoyed. Even though these are the same characters, with the same idea of forbidden love, Maxwell writes a cohesively understandable story of two families: Cappelleti and Monticecco (as opposed to Shakespeare's Capulet and Montague) who each have two young members of the family who irrevocably fall in love with each other. Yes ~ it is the same story... rewritten in a modern sense, and those looking for some unknown insight into the original Shakespearean story may be disappointed. Much like the original, there is a marriage celebration and masked dancing where Romeo and Juliet meet for the first time. They are immediately attracted to each other as the two star-crossed lovers share a love of words, especially Dante's poetic verse, and they banter back and forth with the elegant quotes. Their love springs eternal, and we are swept up immediately in this ardent romance as we hope and pray that they will not have a tragic ending that we know Shakespeare has written. Their love for each other even inspires Juliet to write poetically of thoughts of her Romeo, which was something unusual for a woman in her day. She is hopelessly caught between a family responsibility to solidify her father's silk business by marrying Jacopo Strozzi, her father's soon-to-be-partner. Of course, Juliet wants nothing of Jacopo, he is an older man with no qualities of virtue and is quite unattractive. Juliet realizes he is dangerous as well, especially as Jacopo also sees through the charades of Romeo and Juliet and recognizes their young love, yet he is still eager to marry Juliet so that he will become partner in Juliet's father's silk business. "I propose that after a respectable period I will allow you to pay court to her. You may see her in private, share your...poetry"-he uttered the word with a distinct sneer. "You may lay your lovesick head upon her knee." He smiled and shook his head condescendingly. "Publicly adore her. Meanwhile, she will live in my mother's house, subservient and groveling. She will obey me and stay cloistered there except to go to confession. She will bear my children, as many as I can get on her. I will, of course, have my mistresses." That is what Juliet hears Jacopo Strozzi tell Romeo, and Juliet is petrified of the future that her father has bestowed on her, dooming her fate if she marries Jacopo Strozzi. Yet there is hope, because her father does seem reluctant to let go of his daughter right away. As a reader, I was hoping that the betrothal would not happen, and that the tragic fate of Romeo and Juliet would be averted. There is hope for about a day, until a family tragedy occurs, which makes things even worse than they were before, spinning one tragedy into a domino effect of disasters. There are poignant scenes involving Juliet's insecure thoughts, and touching balcony scenes, which are all written in a modern tone yet with the spirit of the original telling and the nuances of figs, gardens and olives wafting throughout. The imagery of the vegetation and the setting of Juliet's family are rewarding to our senses along with the expressive prose throughout the story, as is indicative by this book's gorgeous cover art. The characters are all well-developed and add their unique aura to the story.. and there are several, from brothers to friars to friends. Jacopo Strozzi and his mother are the perfect villains, Juliet's parents are the perfect see-no-evil parents, and Romeo and Juliet's character's are seemingly written to expand upon Shakespeare's sentiments. I am not going to go further in my telling of this heart wrenching story of Romeo and Juliet, for this is such a fantastic read I am not going to give anything away. This was a predictable love story of course, yet with layers and layers of factors of social mores, religious beliefs and friendship. Robin Maxwell has turned the legend into something that everyone can relate to in such an elegant fashion that I believe that those with an open heart should add this to your to be read pile. Even the cover of this book has the allure of beauty with the abundant flowers and colors. The words inside the pretty cover touched my heart, my soul, left me with a lump in my throat, texted my husband its outcome..and now I am off to read some Dante.